Every once and awhile I stop blathering about my work and bow down to the many book titles that had a tremendous impact on my developing imagination and ability as a Kid Artist with Big Dreams. Like most of the literate world, I adored J.R.R. 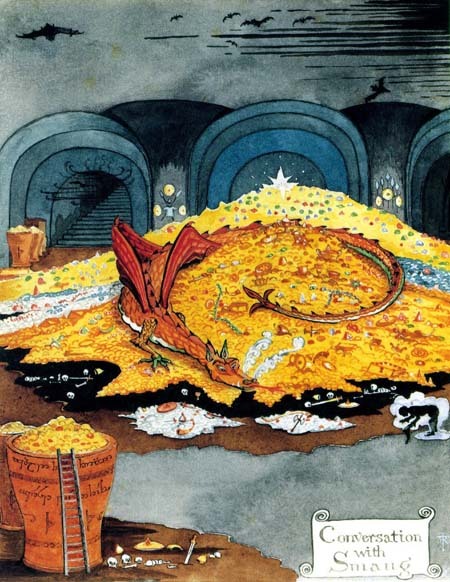 Tolkien’s first foray into Middle-Earth when I read The Hobbit back in middle school. To me, it was an epic tale that I devoured like a hungry troll in between my games of Dungeons & Dragons and Adventure on my Atari 2600. 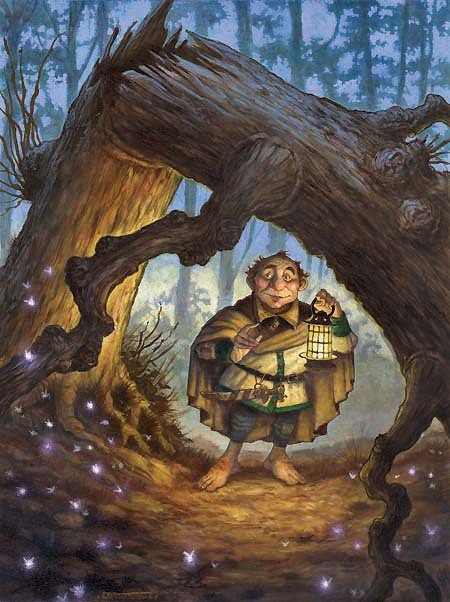 My reality as a pimply lollipop-headed geek disappeared each time I slipped on the ring, opened my dog-eared tome, and plunged into the wilderwood of hobbits, elves, dwarves and dragons. 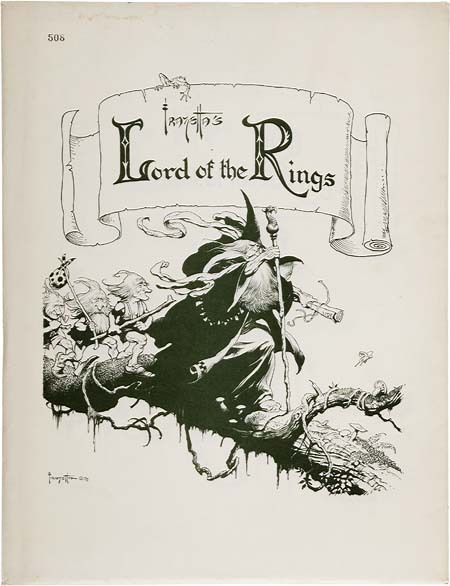 What I didn’t grasp then, is that the copy I read contained drawings by that Gandalf of great storytelling himself. 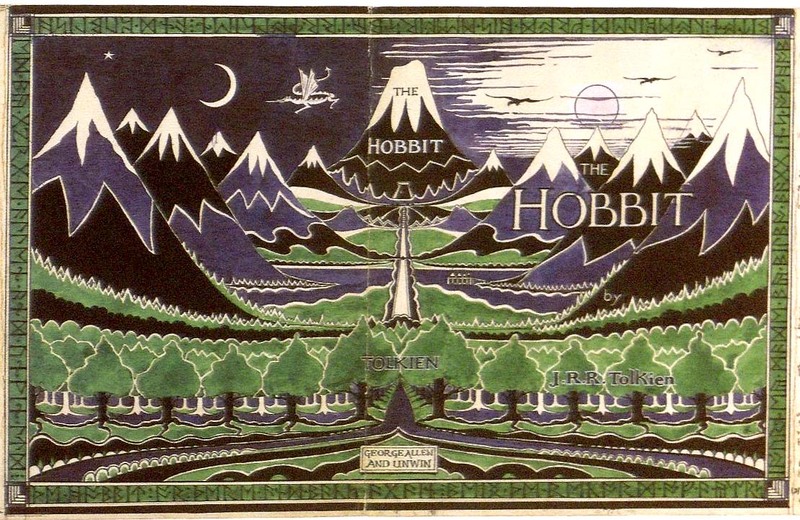 I adored Tolkien’s decorative, almost Kay Nielsen-esque, images of Hobbiton, the Trolls and the mighty Smaug. 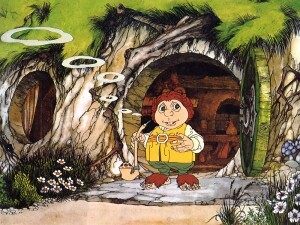 Tolkien’s images were further brought to life in the 1977 made-for-TV animated film adaptation done by none other than the holiday-celebrated-stop-motion messiahs, Arthur Rankin and Jules Bass. The Rankin & Bass rendition of The Hobbit not only galvanized my neverending storybook love of all of Middle Earth, it took it to new heights with its Arthur Rackhamy watercolor backgrounds, somewhat-grotesque character designs and sinister songs. 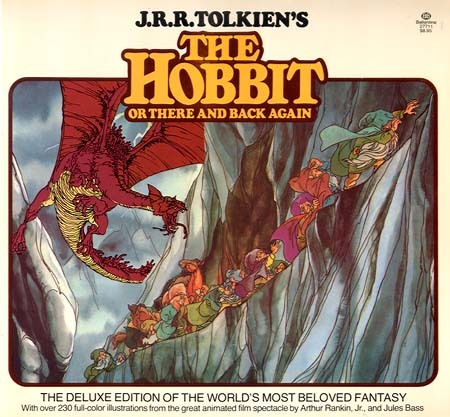 Yes, to some this version may not hold up, but I feel that this adaptation of the story lured in a new generation of young hobbits ready for more adventures. And the nostalgia for the Rankin & Bass film absolutely affected my drawing style as can be seen by this 1997 cover to Dragon magazine. 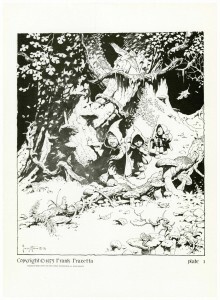 After I graduated art school, I came across Michael Kaluta’s outstanding work done for the 1994 Tolkien Calendar. A calendar!? This phenomenal work should have been put in a leather bound re-illustrated book of its own! Sigh…someday. I still fondly remember spending a rainy afternoon in Michael’s cramped-n-cozy toy-filled studio in the Upper West Side and begging him to pull out the originals for this which he reluctantly obliged. As I looked through these ink-and-watercolor masterpieces I was quickly overwhelmed with a wave of inspiration and a caustic dose of artistic ineptitude. 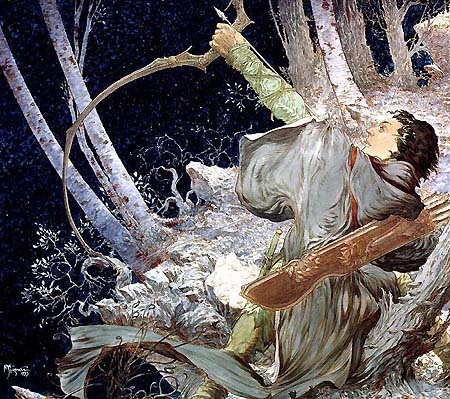 To this day, Kaluta’s passionate visions of Middle Earth are the work of true wizardry. 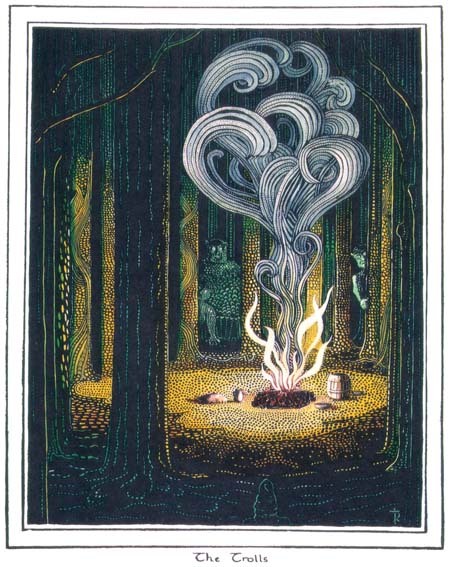 A few years later, I actually got to add a little to the Tolkien universe myself(!) 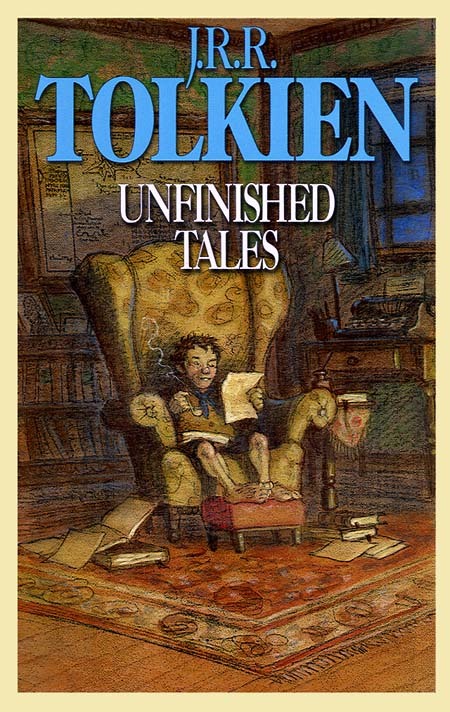 when the art director for Del Rey books rang me up to ask if I’d be interested illustrating a new cover for Tolkien’s Unfinished Tales. (Actually when he called, It was one of the few times in my life where I thought I would pass out on the other end of the telephone). 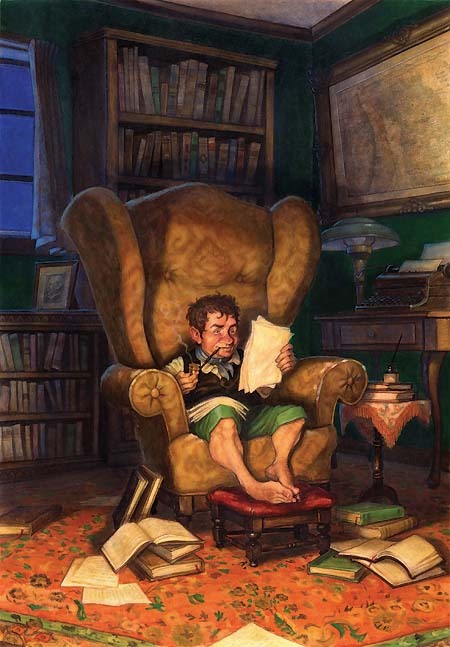 Needless to say, I put my best hairy hobbit foot forward and strove for a unique pic of Bilbo Baggins reading through Tolkien’s handwritten manuscripts. 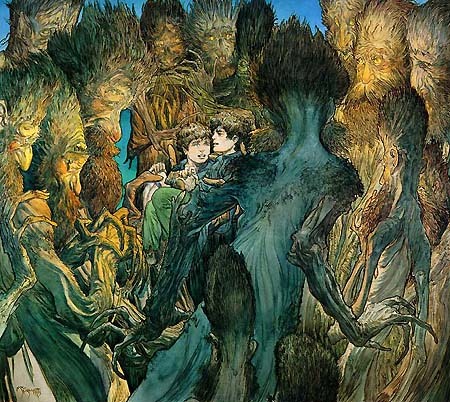 I am pretty sure the Tolkien estate approved this image, so it was a nice day at the DiTerlizzi shire when copies of this gem arrived on my hobbit hole doorstep. 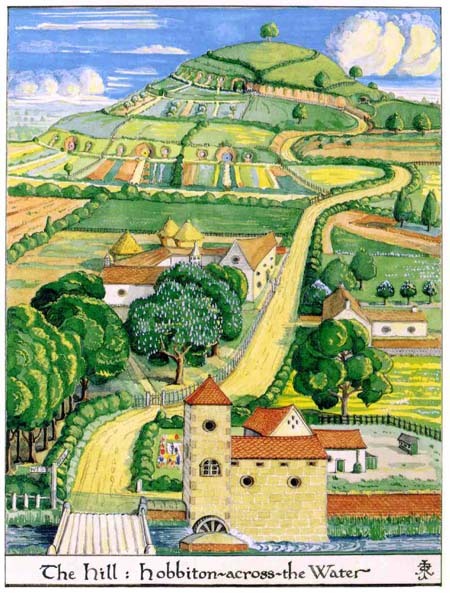 The impact of Tolkien’s magic world still reverberates with me to this day as I am sure it does with many. I re-read The Hobbit last spring in between drafts of The Search for WondLa to see how he handled the passage of time during the journey. (In fact, the camping scene in Chapter 19 was added after the reading). 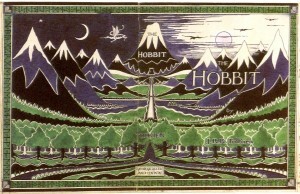 Lastly, I saw how Tolkien was credited on the title page and borrowed the same wording for mine. Though I have penned several picture books a chapter book, and helped plot Spiderwick, WondLa was the first time I truly felt like an author. 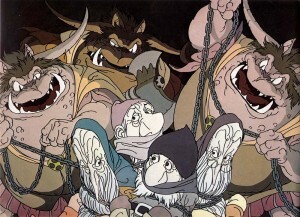 Thanks, John, may you continue to inspire and entertain as you journey to the Undying Lands of the West. Update: This blog feeds into my facebook page where there has also been some great reminisces going on as well. 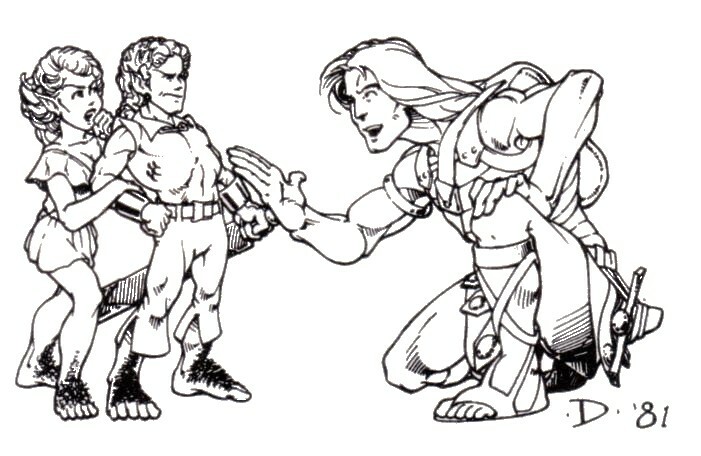 As I mentioned there, I would be remiss if I didn’t mention Michael Hague’s rendition or the Brother’s Hildebrandt. 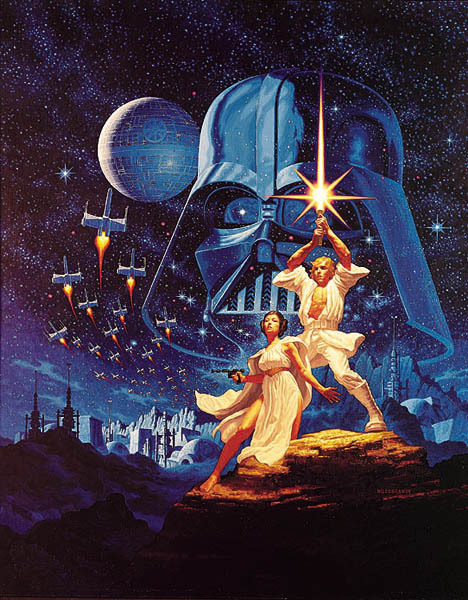 In fact, those calendars the Hildebrandt’s did were right up there with the original Star Wars poster in epic awesomeness. 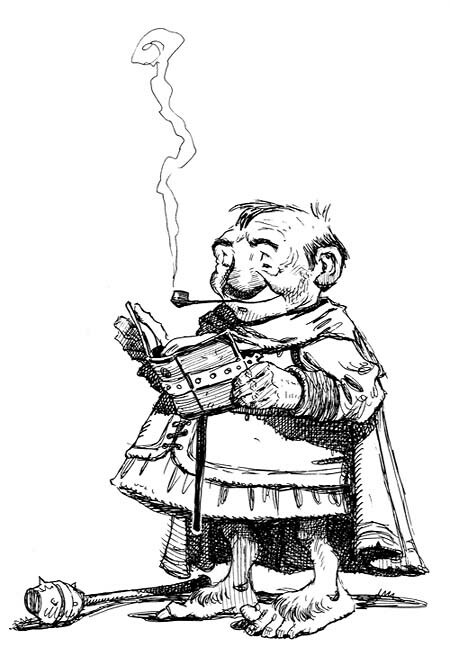 Lastly, I found this wonderful sketch from a proposal by Maurice Sendak done back in 1967. As far as I can gather, he was to meet with Tolkien to discuss an illustrated edition, but suffered a heart attack(!) and the project never came to be…sigh. 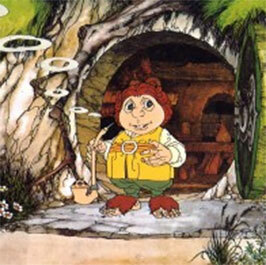 I’m a bit swept away by the response from last week’s homage to Tolkien’s masterpiece about his miniature hero. Between here, Rivendell and facebook I’ve realized that there are many elves, dwarves and orcs who love Middle Earth as much as I. So, as a reprise, I thought I’d dig into my Mines of Moria (aka my Art Archive on My External HD) and see what scraps and bits I had floating around in the digital ether from my brief stint as an “Official Cover Painter for Hobbitses”. 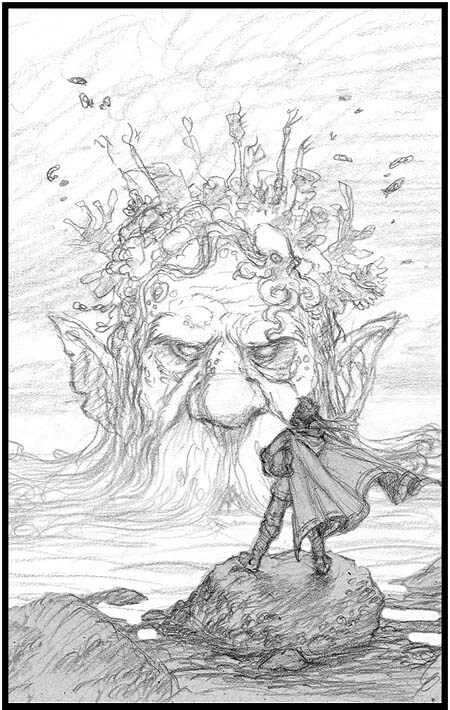 What I found right away, (that I’d completely forgotten) was a decent sketch of the great hero, Tuor, as a possible alternative to cover for Unfinished Tales. 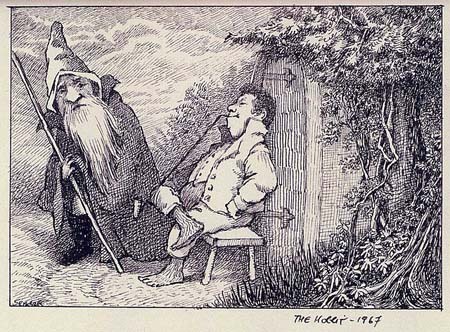 Clearly, this would have projected a much more epic image for the book jacket, but the coziness of Tolkien’s own hobbit-hole won out. Below is the color study for that. 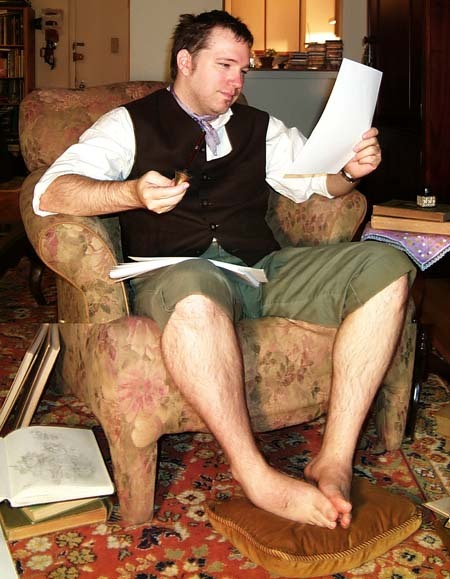 After the sketch was approved, I donned my fanciest hobbit-made attire and struck a quick pose. 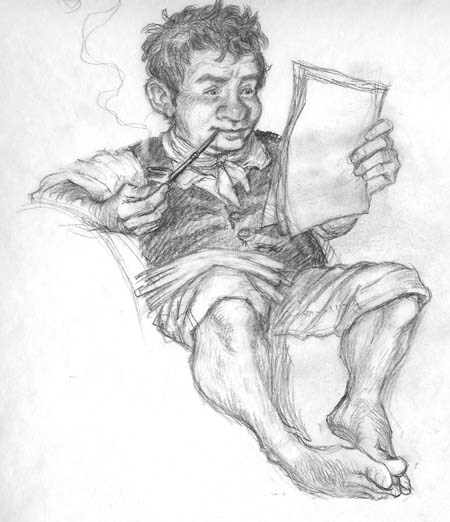 As with any photographic reference, no one photo captures all the elements you need, and so several photos were utilized to create a final sketch of Mr. Baggins. You can check out how it all came together in the final painting posted last week. 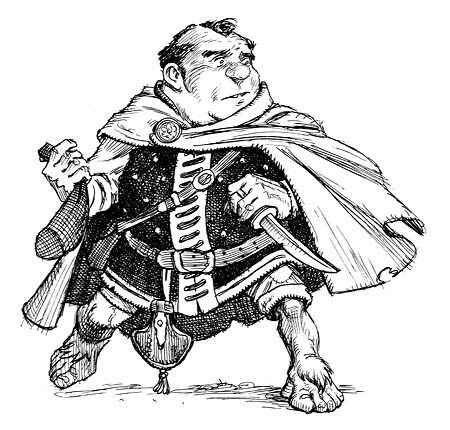 Also in my Illustration Mines of Moria, I discovered some pen & ink drawings of D&D (ahem) “halflings” that were done for player-character sheets that I sold back in my gaming-art days. As mentioned before, my halfings were inspired by the hobbits of my childhood, though I also realized there was a bit of Frank Frazetta in there, especially from his “Lord of the Rings” portfolio released in 1975. Click the image below to marvel at Fraz’ fabulous inkwork. Have a wondrous weekend My Preciouses and DON’T LEAVE THE PATH.